2 Comments on BOOK BLOG MEMES! What’s on your desk Wednesday? is a weekly bookish meme hosted by Sassy Brit of Alternative-Read.com . 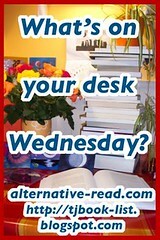 Check her blog out each Wednesday for the post titled What’s on your desk Wednesday? N.B. For those of you who already know me, you may have spotted that this is a different take on my “DESK DARE” feature, only I’ve smoothed it around the edges, given it a new look – it’s the same thing, just more refined. 🙂 Check out these flickr photos! Your pics will be automatically added — unless you say otherwise. Other memes I take part in! Thanks for playing and for your kind words!